Rhoads received her BFA in Glass from the Rhode Island School of Design in 1993, and her MFA in Glass from Alfred University, NY in 2001. She has been an Artist in Residence at the Pratt Fine Arts Center in Seattle, WA, and the recipient of numerous awards, including the Doug and Dale Anderson Scholarship, The Anne Gould Halberg Award, and a Fullbright Scholarship for the study of sculpture in Venice, Italy. 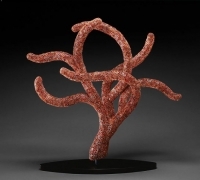 She has worked as an instructor at the Haystack Mountain School of Crafts,Deer Isle, Maine, the Penland School of Crafts, the Studio at the Corning Museum of Glass, Alfred University, and the Pratt Fine Arts Center in Seattle, where she was a teaching assistant for Lino Tagliapietra. 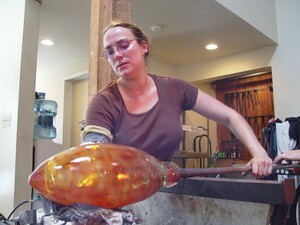 Rhoads has exhibited throughout the US and abroad, and her works can be found in many collections, including the Seattle Art Museum, the Corning Museum of Glass, the Toyama Institute of Glass Museum in Toyama, Japan, and the Glasmuseum in Ebeltoft, Denmark. In her current series of “Peacock Vessels,” Rhoads innovatively explores her love of color and pattern, nourished during her studies as a painter, and combines this with her reverence for traditional Venetian technique.